Burgess spent his childhood growing up in the Deep South during a period when the barriers of segregation were being torn down. He was the third Black American to be offered a football scholarship at the University of Miami. He earned a Bachelor of Science degree in Biology/Chemistry and simultaneously gained national recognition as a First Team All-American. During his college career, Burgess was named to Who’s Who among College Students in American Universities and Colleges. He was inducted to the Hall of Fame of Outstanding College Athletes of America and later to the University of Miami’s Hall of Fame and the Orange Bowl Ring of Honor. Following college, the New York Jets choose Burgess in the NFL 1st round as the draft’s first defensive back, and 13th overall pick. Later that year he was selected as the Jets Rookie of the Year and to the NFL’s All- Rookie team. Entering his seventh season he was traded to the Oakland Raiders, where he led the Raiders defensive squad in tackles during their Championship season and in the 1981 Super Bowl XV game. In his final season, in 1982, Burgess led the Raider’s team in interceptions and was selected as a First Alternate to the NFL All Pro-Bowl. Since retiring from the NFL, Burgess has been involved in corporate and entrepreneurial endeavors. 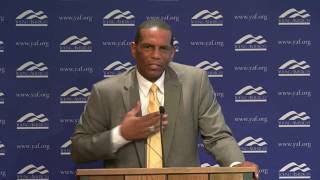 As a Black Conservative he has traveled throughout the country speaking about the intrinsic principles of freedom that underlie the foundation of our American culture. He envisions the message ensconced within the Conservative Judea Christian values as the means resurrecting his once productive, independent and successful Black Community. It will also be the message that will pull our nation back from the dark and evil abyss of Socialism. He is a best selling author, a frequent contributor on the Fox News Channel and has written articles for media outlets that include Fox News Opinion, Breitbart and WorldNetDaily. The Apology: Its time White Americans to Stop giving it and for Black Americans to Stop expecting it. Is it appropriate for the NFL to allow its platform to be used to express anti-American sentiment? The Camera: How our actions, intentions and deeds determine our destination…regardless of whether seen by others or not..